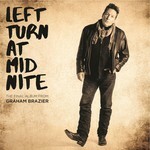 'Left Turn At Mid Nite' is Graham Brazier's last piece of work, that many are saying is his finest collection of music ever. This album has a cohesion that comes from writing and producing all of the songs within a definitive time period in his life where among other things he lost his best pal and musical cohort Dave McArtney. Raw emotion, brutal honesty, iconic voice and musical inventiveness combined with the genius production of Alan Jansson will make it very difficult not to listen to this album from start to finish. Alan is a producer that Graham has wanted to work with for years and Alan has faithfully taken on board Graham's ideas and concepts and caressed them in a way that lifts the entire album to a level above anything we have seen in the past. As Graham says on one of the tracks, "we've kept it tight without losing the excite". Enjoy, savour and devour this album with a glass of wine or whatever your poison is and listen to one of New Zealand's most talented and remarkable poets and working musicians that we have ever seen.